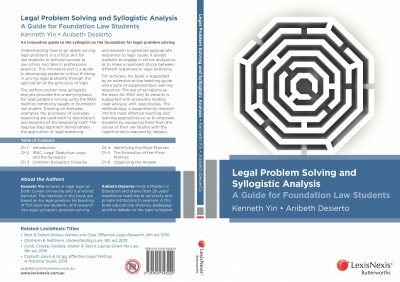 At a bit over 160 pages Legal Problem-Solving and Syllogistic Analysis: A Guide for Foundational Law Students by Kenneth Yin and Anibeth Desierto (published by LexisNexIs) packs a punch. In six concise chapters the book explains and guides the reader step-by-step through the process of setting out a legal argument in correct syllogistic form. By the end of the book the authors have explained and illustrated the entire process and so perform the invaluable service of demystifying for students – and others – the IRAC method of formulating an answer to a legal question. Anibeth Desierto teaches at Edith Cowin University and Curtin University, both in-house courses and pathway programs, and focuses her teaching on academic literacy, communication skills, and research. Kenneth Yin, a former practising barrister experienced in the preparation of legal argument and now a lecturer at Edith Cowan, is committed to improving the way the IRAC method is explained to first year law students, in particular in making the connection with syllogistic problem-solving, which the authors remind us is the essence of IRAC.